I played football yesterday evening: distracted and short of sleep, I was rubbish. After getting the kids to bed I then dozed off in the bath and woke only just in time to watch the latest televised debate. Perhaps my fatigue and mild disorientation help explain why I found it rather depressing. Though Alastair Stewart hosted, the questions came from the studio audience amid a bit of a bear pit atmosphere. That's often a recipe for more heat than light, and so it proved. Yesterday afternoon I wrote that Livingstone had been having slightly the better of the TV encounters, thanks mostly to Johnson's continuing inability to get his story straight on bendy buses. But no candidate emerged as a clear victor last night. It didn't help the event that some of the questioners had their facts wrong. One accused Johnson of writing that black people have lower IQs. He didn't: it was the rancid Spectator columnist Taki. Livingstone corrected the questioner, but went on to hammer the point that Johnson had been editor of the Spectator at the time. Johnson had been pre-armed with a riposte, claiming that anti-semitic material had appeared in a long-forgotten far left newspaper which he claimed, incorrectly*, that Livingstone had edited. I'd say Livingstone - "the Labour mayor" as Johnson often calls him, hoping a bit of Brown stuff will stick - had the better of that exchange, but was more on the defensive over crime. The most dispiriting aspect of the debate was the three of them competing to sound the most "tough" on the subject amid the surrounding emotion. I think Paddick has the best policing policy, but the truth is that, like all politicians, they've all been making claims about crime that they can't justify and promises they're in no position to keep. As for the question on buses, the man asking it seemed even more confused about Johnson's policy than Johnson. The Blond's reply was to insist that he has said "repeatedly" that £100 million should take care of it. The truth is he's only been repeating the figure since letting it slip by accident in front of someone's camera phone in Edgware. Perhaps I'm suffering from campaign fatigue. Perhaps they are too. How about holding the election a week early? * My mistake. Livingstone was joint editor of Labour Herald for a time in the early Eighties. Thanks to those who've pointed this out. They’re like long distance runners now, gathering their strength for the last lap; or boxers about to start their final round. On Monday, the latest YouGov poll showed a far smaller lead for Boris Johnson over Ken Livingstone than had the previous three - down to six points from consistent double figures – but with every other poll showing little to choose between them, neither will be paying undue heed. Each knows that the other remains firmly in the contest, and that every fragment of advantage could prove decisive. Tonight, Livingstone, Johnson and Paddick debate live on Newsnight. This time, there should be no place for any of them to hide. I'll be watching - assuming my recent, mind-scrambling shortage of sleep doesn't ambush me - but if for some reason you can't and yet can get online, Jason Brown will be live blogging the whole thing. "The shape of the remainder of the mayoral race came into sharper focus last week thanks to one conspicuous absence, one opinion poll and three supposedly 'secret' children. The absence was Boris Johnson’s from Time Out’s hustings at ULU on Wednesday, which Ken Livingstone, Sian Berry and Brian Paddick all attended. Why did The Blond not appear? That depends on whom you talk to. Time Out complained that it “bent over backwards” to accommodate Johnson, but Team Boris took a different view. Whatever the reason, his enemies claimed that Boris had bottled it, prompting the swift riposte that Ken has missed a few events too. What’s more, he looks like missing the NO2ID Cards hustings on 8th April and the Tory Centre for Social Justice’s on 16th April. 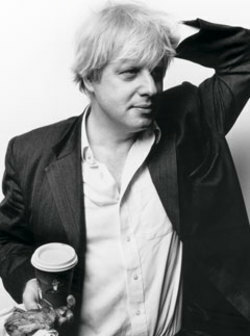 "Mr Johnson will be boosted by the poll, which comes as he prepares to unveil his most eye-catching policy, a ban on drinking on the Underground." Boosted? Most eye-catching? Don't think so! UPDATE: Ha ha! At the time when I linked - at "Boosted?" above - to the Standard's coverage of the poll, its headline read something like "Boost for Ken In New Poll." It has since been changed to something far less suggestive of a Ken revival. I blame Veronica's cat. He's a Labour Councillor in Merton, and he's for Ken. "His aides kept a close eye on him. 'Boris is off drink until the election is over,' said one, cutting off a vendor who tried to give Mr. Johnson a cup of alcohol-laced cider. Passers-by snapped his photo. 'Go, Boris!' yelled a group of women. 'Loser, Boris — loser,' muttered a man." PS: A techno-duffer writes: when this arrived via google alert I had no need to register. Now I've linked to it, there is. Sorry. "Wise move or election gaffe, he gains because it reminds people of why they liked him in the first place." "Incidentally, just because the Evening Standard says Tessa Jowell has been 'parachuted in' to run his campaign and make him change his message doesn't make it true." Why do I say this? Not because Team Ken told me that Anne McElvoy's recent piece making this claim this was "complete cobblers," but because none of the quotes in it from Jowell about what Livingstone's message should be seemed the least bit at odds with what his message has been all along: basically, "Unlike that blond chap, I get things done." Crumpet, eh? He's interviewed in Marie Claire. It's the stuff he won't talk about that's most interesting. "Q: Have you taken a vow of fidelity during your election campaign? A: I think people in London don't give a monkey's. Q: But your wife might. A: She's wonderful, and I really don't think the public cares about this. What they want is someone with energy and commitment and passion. Q: I agree, but they might want someone with all that energy and passion going into the job, and not into bonking someone down the road. A: [Laughs.] Janet, they want someone with energy and commitment and passion for the job, and that's what I can deliver." "[Laughs]?" Adultery is no laughing matter, young man!